How do NYRR club points work? 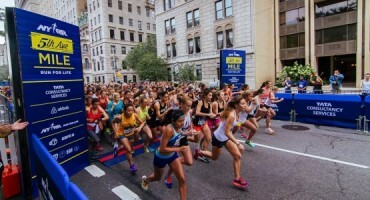 NYRR serves as an umbrella organization for local NY running clubs by hosting a Club Council and an annual team-points series for both men and women. Each year, the Club Council designates 11 NYRR races as Club Points races. The fastest 5 runners per division from each club have their finishing place added together (e.g. a club has 5 women place 1st, 4th, 16th, 199th, 200th = 420) and the clubs with the lowest totals are awarded the most points. Every club with at least 5 declared male finishers or 5 declared female finishers are awarded 1 point regardless of the total. (Exception: only 3 are needed for the Marathon). The 9 best scores of any race of the 11 race series make up the club’s overall annual ranking.